This new mold by Doreen is a completely new sculpt release. The features are very different from her other molds, like he has higher cheekbones and a different nose and lips. 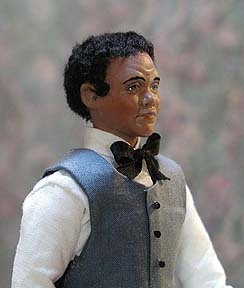 He is a very handsome 6" tall, middle aged man. Marcus is a head on torso mold. You can use Mans arm and Leg mold "L" or any suitable mans arms and legs. He is assembled with pipe cleaners. Complete assembly instructions included with all of Doreen's molds. "Chrystal" consists of three new molds by Doreen. Chrystal has a beautiful kneeling body, Chrystals new 3/4 length arm mold and the head mold, which contains 2 different heads. One with open eyes and the other with eyes looking down. She is shown above with 25C Iron On Transfers in Gold outline. This picture shows Doreen's Scarlet Head (H2 mold) on Chrystals kneeling body with Chrystals new 3/4 length bent arms. Any of Doreen's ladies head molds, with the swivel heads, will fit this lovely body. Chrystal's face with the open eyes. Also showing her new 3/4 length bent arms. This leg mold has 2 beautiful, bent legs that will fit Arial's body. (The legs are pictured to the left, and below, on Arial's Body, head and arms. 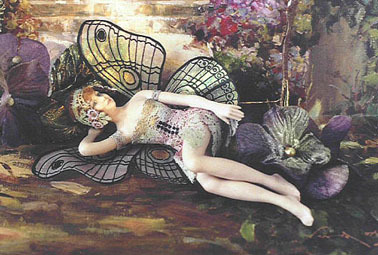 (Her right arm is slightly more bent than the actual arm directly out of the mold) Arial is shown below with our 25C Iron On Butterfly Wing Transfers. 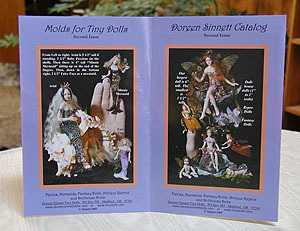 Doreen's new 2nd Edition catalog, released February 2004. Click on any category to view Dolls!